Social media automation is a topic that is a little bit touchy for many individuals who are weary of the consistent bombardment of content. However, for those who want to boost their audience to reach many more people, social media automation is necessary. We’ve talked about reposting content to double your reach, but what are the best social media automation tools that you can use to help you with the seemingly monumental task of making sure that your traffic is consistent? Remember, though, there are many important strategies to consider when automating content. Check out our previous article to find tips to increase productivity in this area. What are the Best Social Media Automation Tools to Better Reach My Audience? What makes this one of the best social media automation tools? dlvr.it offers many options to automate posting to social media. From automating your blog within minutes of publishing – to scheduling posting – to queuing your best content for resharing, dlvr.it has a full arsenal of tools to make your life easier. dlvr.it offers the ability to post multiple posts per day from an RSS Feed to Socials. On the basic plan, users have the option to post to three different socials from different platforms. 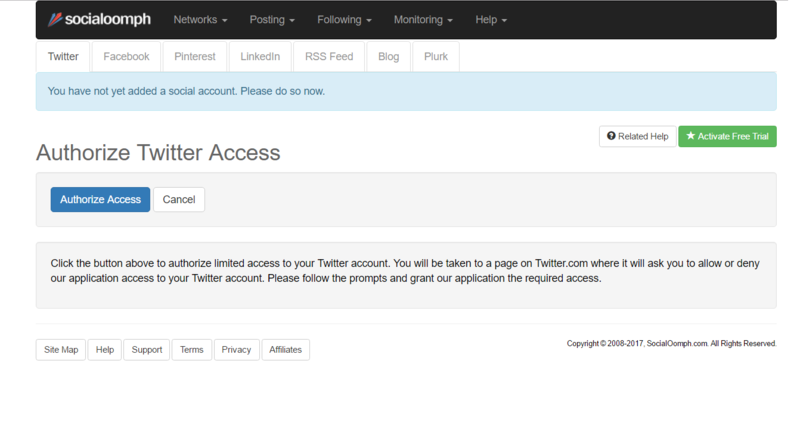 Free users can also use content filters to exclude any posts that do not meet criteria automatically. dlvr.it also offers Instagram integration as an input, as well as Twitter and Pinterest. This platform integrates into many different social media platforms. dlvr.it also offers the ability to either schedule posts, or post automatically. The Pro plan is reasonably priced for most users. At $9.99 per month, users can expect to be able to use up to 10 social media accounts and up to 50 sources of input. The price tag of the Pro plan also provides access to the Echo feature. This power packed feature helps you drive more traffic by queuing your posts for resharing. dlvr.it also offers a free trial. 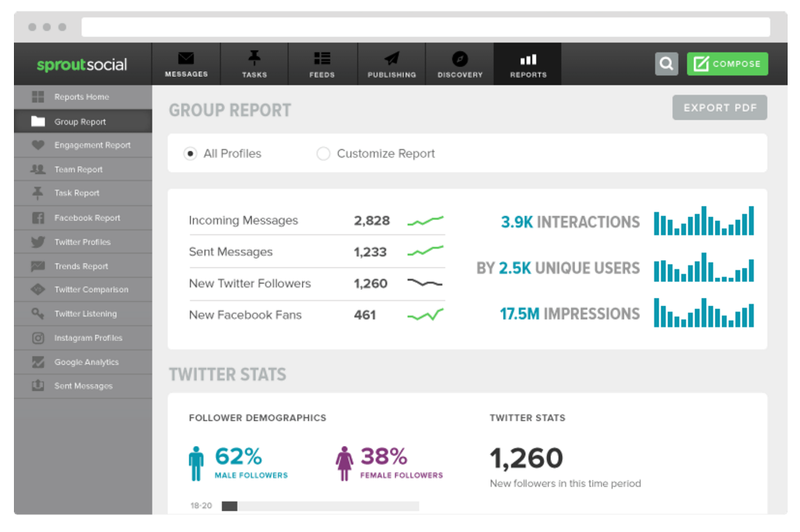 Analytics for dlvr.it offer just click stats and follower stats. However, you can add Google analytics tags with additional parameters attached to your social media accounts. dlvr.it also does not provide in-depth demographics of followers. Hootsuite has built a platform that is attractive to marketers because of its built-in analytics. Hootsuite’s software packs a punch using Analytics. Hootsuite provides in-depth, detailed analytics that can help you to determine your audience engagement, metric performance, and real-time feedback. Hootsuite offers basic analytics for their free users, as well as enhanced analytics for its Pro users. For its free users, RSS integrations are free and unlimited. Upgrade to their Pro plan, and you can schedule bulk messages. Hootsuite also offers its users support through free social media classes. Hootsuite does offer all of these features but prevents its free users from using more than three profiles. Hootsuite also does not allow image posting for its free users. Their analytics provide a lot of power, but for the novice user, this can be very confusing and difficult to understand. The front dashboard can be a bit confusing if you are not used to looking at so much information. Buffer is a tool that works with input sources and social media accounts to publish your content quickly and easily. 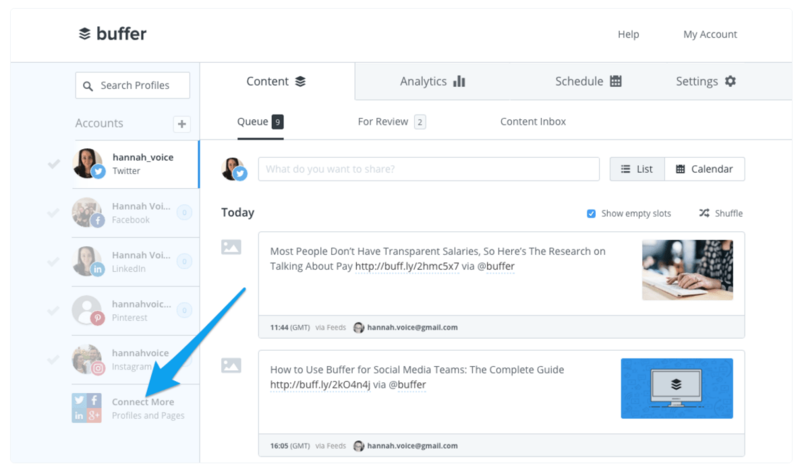 Buffer has a wealth of tools that help their users stay connected to social media wherever they are. They employ the use of a mobile app to make it quick and easy to schedule a post from anywhere. Buffer has also created a system that will work to find the best times to post your content. Possibly the most attractive feature that Buffer offers is the option to create infographics inside the tool. Buffer offers a tool called “Pablo” that allows you to create graphics within the app and will allow scheduling of this post also within the app. With access to the Pro plan, you will gain access to use RSS feeds as inputs as well as the Calendar feature. Buffer offers some Instagram integration, but this integration is a tad misleading. Buffer reminds users to log into Instagram to post content. Essentially, the only automated function of these reminders is the reminder itself. Also, if you are a basic plan user, Buffer significantly limits the functionality of their app. For their basic users, they will only allow one social media account per platform, and will only allow you to schedule ten posts at a time. There is also a significant limit for their next step plan. This plan allows you to schedule 100 posts for ten profiles. Social Oomph offers management of social media platforms like Facebook, Twitter, and Pinterest. Social Oomph integrates with a few different platforms including LinkedIn, Facebook, Twitter, and Pinterest. The most powerful feature that Social Oomph provides is to track Twitter followers and keywords. These platform analytics provide quite a bit of information about your audience so that you can tailor your content to your audience. 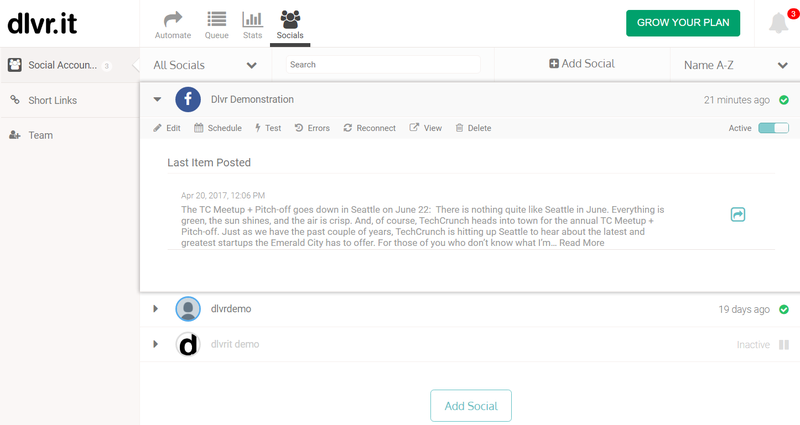 Social Oomph also allows your employees to submit content via email, which will allow you to avoid needing to add team members to your account. You will instead be able to review and approve content from your own login information. 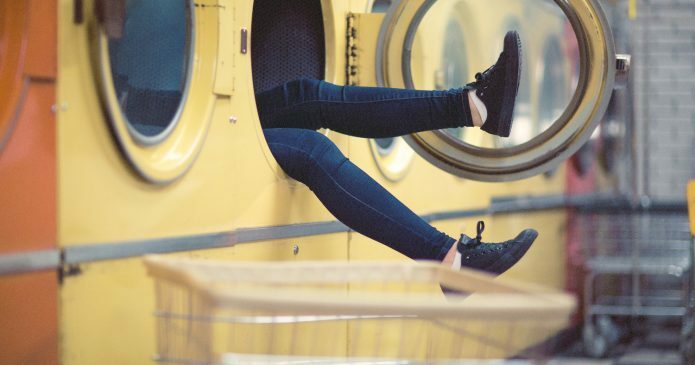 Social Oomph severely limits its free users, only allowing connection with Twitter at the basic level. Complete automation only occurs at the professional plan level, which is a higher price point than many on this list. The professional plan runs $17.97 every two weeks. IFTTT is a platform that allows you to set up a number of triggers. The acronym stands for If This Then That. This means if a certain condition is met, then an action is performed. Why is it one of the best social media automation tools? IFTTT works on the formula of recipes. You set a trigger, whether it be a YouTube video published, a Tweet sent, or a new blog post on WordPress, and then set a result. The result indicates where this content moves. IFTTT has a huge variety of triggers and resulting actions. Recipes on IFTTT are extremely varied, and possibilities are endless with the trigger options. Costs can start to get steep with this platform. There are only two levels of the plan, which start at about $1,200/year and do include unlimited triggers and actions. The only other option is to pay around $6,000 per year to customize your plan. Sprout Social helps business users manage and analyze social media impacts across platforms. Why is this one of the best social media automation tools? Sprout Social follows the analytics protocol, providing its users with many different types of analytics and interactions. Google Analytics are an essential feature of what Sprout provides. They integrate this into their dashboard so that you don’t have to run to Google to find out why your traffic may have dropped. Team members may also be added to all plan levels. They also have options to automate your social media content via a Social Content Calendar. Sprout also can decide the optimal times to deliver your content if you have trouble deciding when to publish. Sprout is one of those platforms that is on the more expensive side. While they do offer a 30-day free trial, they also start their pricing at $99 per user per month for their most basic plan without adding additional users. Sprout also lacks Pinterest, Instagram, and multiple Google+ page interfaces. These features may be available on one of the other tools mentioned previously. 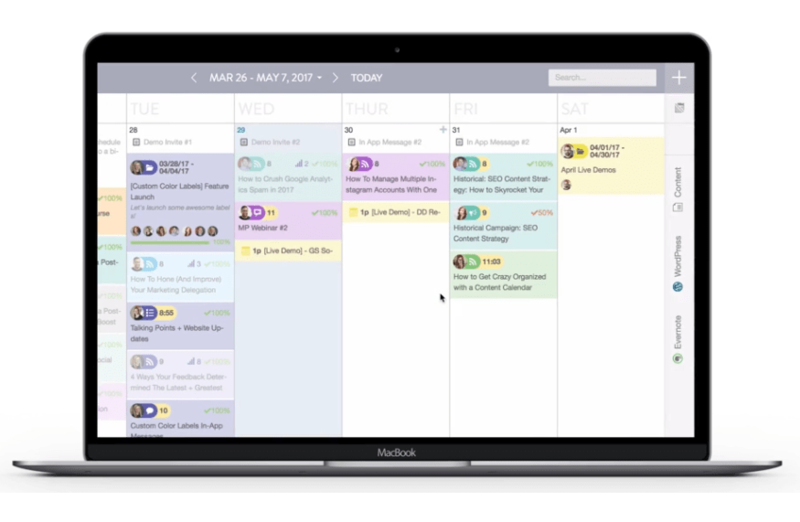 CoSchedule is a more robust platform that allows for posting and scheduling in a drag and drop calendar format. Why is this one of the best tools for social media automation? CoSchedule offers a drag and drop format calendar that allows you to categorize your posting. This tool also allows you to select evergreen content, which can be posted indefinitely. The tool will also select the most popular posts in your history and repost them for you. CoSchedule also has integration options with Buffer. CoSchedule is similar to Sprout Social in that there is no option for a Free plan. The lowest cost plan offered by CoSchedule is $30 per month for 10 Social Profiles and one user account. In our experience, CoSchedule does require a lot of initial setup. There is a significant time investment up front in setting up the account and calendar. However, once set up, only minor alterations are required. MeetEdgar is a platform that enables you to schedule evergreen content quickly and easily. 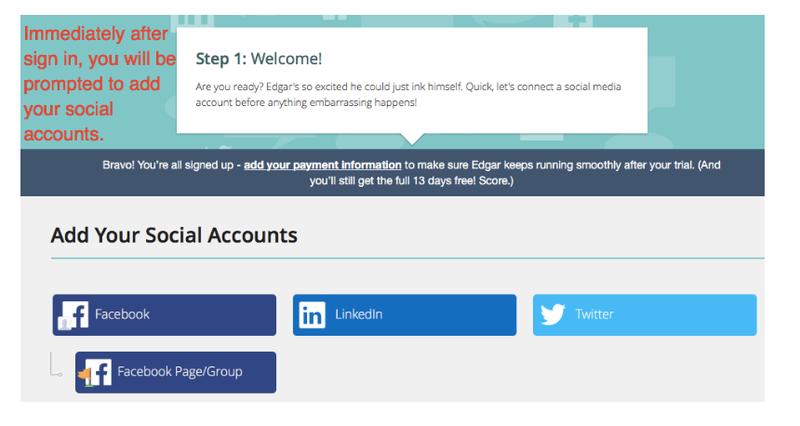 MeetEdgar provides scheduling tools for multiple social media platforms. The scheduling tool is quick and easy to set up and can be set up to send content multiple times. MeetEdgar also provides extensive video tutorials on their site and screenshot support documentation, which makes it far less difficult to set this up. MeetEdgar is useful for a few platforms, like LinkedIn, Facebook and Twitter, but does not offer integration with any other platforms. The software also does not provide any automatic native link shortening, but rather, forces you to utilize bit.ly for any links that you would like shortened. KingSumo is a WordPress plugin that helps to determine which titles are most appealing for your articles. While KingSumo isn’t exactly a social media automation tool, it is extraordinarily helpful when you are creating your own content. KingSumo is intended as a plugin to help you select the most appealing titles for your articles. The plugin can generate a catchy title, or it can allow you to create titles yourself. And, with lifetime licenses, it presents an irresistible value. Did we miss any of your favorite social media automation tools? We’d love to hear from you. Please feel free to include your thoughts in the comments!